When you don’t have to sacrifice your love of the outdoors for your career or vice versa, it’s something special. In fact, my love of both skiing and marketing has grown dramatically since I took my job at Backcountry. 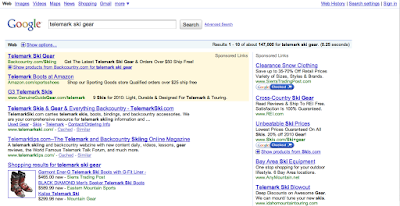 Getting to work with Google, specifically managing our AdWords account, is an online marketing geek’s dream come true. Combine that with every skier’s dream of Utah powder, and life is good. Backcountry was founded in 1996 by two self-proclaimed ski bums, John Bresee and Jim Holland. Since then, the company has grown to hundreds of employees. I’ve been working here for over two years. Ultimately, our goal is to “crush it,” as some ski town folk say: work hard, play hard. A typical powder day for me is like this one last Friday when Park City got 12 inches of new snow overnight. Here’s how AdWords helps me manage both work and fun. If it looks like a good ski morning, I first check my email and glance over our AdWords campaigns. All I need to do is my daily reporting to see that I’m on target for my revenue and cost goals. As long as things are okay, I email my boss to say I’ll be out slaying the white dragon. Just as I have the ideal tools to maximize our online campaign performance, I have the tools avid skiers covet for deep days: fat, rockered skis, stiff ski boots, Gore-Tex jacket and pants, helmet, goggles, merino wool layers, etc. After I grab my gear, I’m off. Face shots are invigorating. Hard to explain, best to experience! After a few glances at the time and collecting my thoughts, I make my way off the mountain. I head a few miles down the road to the office. As the afternoon goes by, co-workers will emerge from their cubicles; sometimes because legs are cramping up but also to share stories about how the morning was. Where did you ski? How was the snow? Smiles all around. I settle into work knowing what I need to succeed at my job is at my fingertips. AdWords gives me visibility into my programs to prioritize and understand trends. It also makes it easy to add and edit my account without getting bogged down in manual work. I regularly use Keyword Performance Reports to monitor both head terms and tail terms to stay on top of revenue opportunities. I’ll take into account the average order value and also the percentage of clicks that turn into sales (rate of conversion) in order to manage our keyword bids. As I do bid updates, I also check the AdWords Preview Tool to see how our ads are ranked and what is going on with our competition. We don’t really focus on “cost-per-click” but instead on “cost as percentage of revenue,” which means the more people purchase, the more ads we can run. So the higher the return on advertising spend, the more room we have to grow our paid search presence. I like this afternoon time in particular because it’s quiet and I can really focus on data-crunching. Uninterrupted time and a strong cup of coffee are essential for doing long-term analysis. Campaign Performance Reports are great for identifying long- and short-term trends as seasons shift or for changes in demand by brand. We just wrapped up our winter sale, so this is a great time for me to run an Ad Performance Report to analyze which versions of ad copy had the strongest clickthrough rates for future reference. Finally, Google Insights for Search is a fun tool. It’s a great way to connect with our buyers by discussing big-picture trends with the brands we carry. We can look at AdWords Campaign performance and try to tie it back to general search volume in the marketplace and identify product searches on the rise. In short, given our metrics focus, AdWords gives me the information I need to make decisions about specific keywords, bids, and our overall spend. There are typically the same few folks hanging out at the office this late. We’ll exchange some pleasantries, and as the lights get turned off I’ll shut down my computer. When I earned an undergraduate degree in marketing and cultural anthropology, I had only a vague idea how I was going to create a career with behavioral and analytical activities. It turns out online marketing is an exciting mix of real-time data and customer service. AdWords lets me manage campaigns very efficiently, so I have time to dig deeper and do the strategic analysis that makes this job about much more than just meeting revenue goals. Finally, I picked Park City because it’s more than a ski town. Here fanatical skiers, trail runners, bikers, snowboarders and climbers can live year round and still have a meaningful career. I’ll always be grateful to companies like Backcountry and Google for making this possible: Backcountry for fostering the passions of the outdoor enthusiast, and Google for innovation in creating the forums and tools that really work for us.